Fairytale, Indeed! Perfection wrapped up in ribbon! I wish there was a way to put into words how unbelievably blessed we feel to have found Lindsay and the Fairytale Floral team. Lindsay stayed in touch throughout the entire process to ensure we felt happy and confident. As for the flowers, we were completely blown away. Fairytale Floral went above and beyond. Every single piece brought into our venue by this team was beyond what we could have ever imagined. Haley's bouquet was one of the most important things to her, (she keeps flowers forever) and it was stunning. Lindsay arrived on the day of and stopped in to say hello to both of us and immediately began setting up the entire space. It was absolute perfection. She even helped decorate and set things like our seating chart up because we were running behind schedule. She smiled and worked away! She also came in afterward and helped clean things up the following day. That was totally unexpected. She never said a word, just did it all out of the kindness of her heart. Lindsay, we cannot thank you enough for all that you have done. You will be happy to know that Haley will have your flowers hanging around house for the rest of our lives. You are incredible in every way! Fairytale Floral made all the difference! 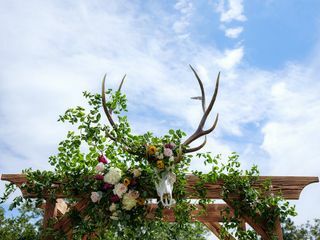 Fairytale Floral is the most professional and creative floral company I could have asked for, when it came to my wedding! We had a general theme and Lindsay was able to create something that was better than I ever dreamed! Highly recommend Fairytale Floral to everyone looking for floral arrangements and decorations that will inspire for a lifetime. Lindsay at Fairytale Floral is a dream to work with! I am so beyond happy with her services. 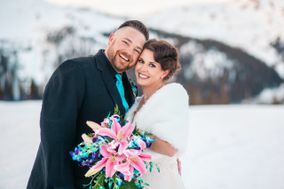 It was snowing on our wedding day, and Lindsay still made it up to Vail from Denver and made sure everything was perfect. Everyone raved about our centerpieces! I only told Lindsay a few key things and she was able to get my vision perfectly. I cannot imagine going with anyone else and cannot recommend her enough. We could not have asked for a better florist for our wedding. Lindsay is so sweet and is really a pro at what she does. I know nothing about floral and didn't have a very specific view and Lindsay was able to produce exactly what I was looking for (and I didn't even know it!). She is very professional and responsive and really has an eye for putting together beautiful arrangements. Lindsay was amazing and I recommend her! She helped me decide on a style, was easy to work with and delivered the flowers on the wedding day! She has so many things to rent and choose from that it made my destination wedding so easy! 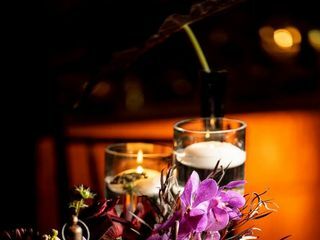 The flowers were great and the service was better! Lindsay is such a doll! She was a pleasure to meet with and even though I felt like my ideas were scattered and my vision was all over the place- she seemed to just GET IT. She felt what I felt and from that she created the most amazing floral spread for my special day, I could never have curated anything better myself. She also went above and beyond by helping to lay out my table arrangements and providing me with some last minute requests. She made everything so easy on my end and when I finally saw my bouquet on my day my jaw literally dropped. Thank you Lindsay for helping to make this the most magical day ever. Thank you, thank you, THANK YOU!!!!!! Lindsay does absolutely beautiful work!!! I have seen her other designs and been in awe but when she custom does them for you wedding there is nothing more breathtaking. The bouquet literally made me cry, that’s how pretty it was:) thank you again Lindsay!! Lindsay does such a wonderful and beautiful job!! I highly recommend her for all occasions! Fairytale did an amazing job on our wedding! Lindsay has the most energetic personality and is so easy and fun to work with! The floral arrangements and decoration turned out better than expected!! Stephanie, thank you so much! It was lovely working with you and I absolutely LOVED your color choices!! I so wish we could have met in person, but am so happy Sunshine connected us :) Congratulations and thank you again. Lindsay was absolutely amazing! She drove to meet us for our first meeting and right away we loved her! She totally got our vision for our wedding day from the 1st meeting. She understood our theme and was full of options that fit perfectly in our color scheme and theme. Over the time planning the day, she was responsive and quick to answer questions. She worked with in our price range and was able to make any changes we needed. She called us about a month out to go over everything and make sure we were all set. On the morning of our wedding she brought down the flowers for us to see and they were all just perfect! She worked with our wedding planner to set up our venue (ceremony and reception space!) and I didn't have to worry about a thing! It truly felt like a fairy tale as soon as I walked in and saw everything she had created. Everything was even better than I had pictured it! We received so many compliments on how beautiful the flowers were and her amazing decorating job. On top of it all, she is so sweet and knowledgeable and was a pleasure to work with! If I ever need flowers again I will go straight to Fairytale Floral! I am thoroughly impressed with the services and products that I received from Lindsay. First of all, she was an absolute DELIGHT to work with. She met with me on two separate occasions: once when I was shopping around for a florist and once when my grandma decided she wanted to help pay for the flowers for my wedding. Even though I didn’t change my idea of what I wanted it meant a lot to my grandma to be a part of the whole experience and Lindsay was super cool and accommodating when it came to meeting up. After our first meeting we ended up chatting it up for a while because she is just that amazing!!! At our first appointment I explained that I wanted a bouquet that fit the theme of “a mad hatter tea party that was left to the elements for centuries...think teacups spilling over with moss and flowers and broken clocks covered in moss.” She took this abstract concept and absolutely NAILED IT. When I saw the bouquet for the first time it literally took my breath away. It was better than I could have ever imagined. My boutineers were also perfect and exceeded all expectations. Her prices were very reasonable, especially considering the fact that her work is remarkable and she really knows her plants! She received a degree in floriculture and it shows in her work...she used plants that I had never even seen before but were the perfect addition to the bouquet. I am so glad that I trusted Lindsay to be my florist and I suggest if you book with her to utilize her opinion as a professional and an artist because she really knows what she is talking about! 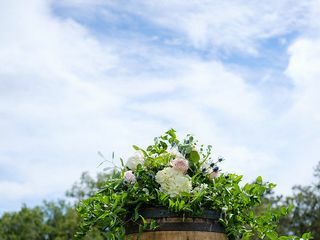 If you want a stress free, beautiful wedding with a florist that will create your vision and easy to work with, Fairy Tale Floral is for you!! We absolutely loved working with Lindsay! 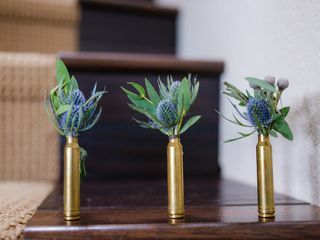 From the moment we first spoke with her we knew we wanted her to design our wedding flowers. What immediately jumps out is her calm demeanor and she truly listens to your thoughts and concerns. 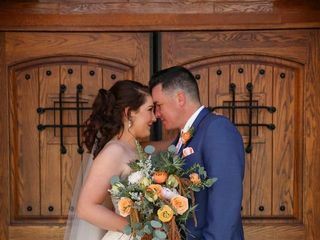 She created a plan that worked for our budget and made amazing design and color recommendations. We loved loved loved our flowers! Go with Lindsay and Fairytale Floral for beautiful flowers and stress free delivery and set up. Brenda you are so sweet! Thank you so much for such a lovely review. You and Liz were a dream to work with, I'm so happy you loved everything! Congratulations again- I love your photos! Working with Lindsay was a delight! Every interaction was so warm and friendly, and she definitely made us feel taken care of. She completely understood and brought into reality my vague “vision” of the wedding decor and the flowers fit perfectly into that! I was in awe of the final product, it was better than I imagined. One of the best vendor decisions I made! We truly loved working with Lindsay! She is so laid back and easy to work with. She completely blew me away with our beautiful floral arrangements. 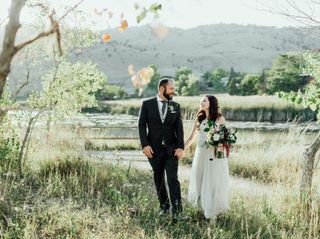 We are so grateful to have found someone as kind and easy to work with as Lindsay and appreciate all she did to help us achieve our dream wedding! Fairytale floral created the most beautiful and unique flower arrangements I have every seen! I was obsessed with the bouquets. I cannot say enough about how awesome their design was and how easy and friendly they were to work with. I think everyone should work with them to get their fairytale wedding! Thank you so much Morgan! You were SO awesome to work with, I absolutely loved everything about your wedding :) I'm so sorry for this very late reply, I hope you and Seth are have a wonderful anniversary! I loved working with Lindsay!! On top of us having top notch flowers for our wedding day, she is very kind, pleasant, and easy to work with. Once my mother in law offered to pay for the flowers we switched our main communication from my mom to my mother in law with Lindsay, and Lindsay handled the transition great. We also added a lot of extra flowers as we approached the wedding, and Lindsay did an amazing job communicating with us. Lindsay was happy to stay in our budget and was never pushy about adding extra flowers. On my wedding day, I felt like I could trust Lindsay to come on time with amazing flowers, and she did! I would definitely recommend Fairytale Floral to a friend! Lindsay is amazing. She has such a great eye for unique arrangements. She made my wedding so incredible and was a dream to work with. Thank you Lindsay!!!! Thank you so much Samantha!! You and Cody were so wonderful to work with and you looked absolutely stunning! You are SO SWEET Amanda!! 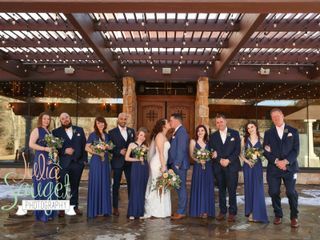 Thank you so much, I loved everything about you and Connor's special day, so it made it very easy to design :) Plus, it was so fun to design another McCluskey wedding! Congrats again you two, hopefully I'll be seeing you soon! I don't know where to start, first off not only is Lindsay an amazing, talented person she was so sweet and patient with me and my fiancé through this whole process even when I sent numerous revisions for her!! And the work she does is absolutely out of this world! Everyone at my wedding was amazed by the work she had done, I had numerous people asking who did them and even the other vendors wanted her name. She is so talented I couldn't have asked for anything better. My wedding was the most perfect day and she had a lot to do with that! Thank you so much Lindsay for everything that you did for me and my husband!! We love you! Lindsay at Fairytale Floral is an angel and an artist! The floral arch and the flower arrangements she did for our wedding were incredible. I would recommend her services in a heartbeat! Kelsey- Thank you for your amazing review, you are so sweet! I absolutely loved working with you and Nick, and am so in love with your beautiful photos! Congratulations again, beauty! Lindsay is so easy to work with and my flowers were amazing! Thank you so much Jenn! I absolutely loved designing your beautiful wedding, congratulations again!